Earlier this year, Sega released Thor: God of Thunder on four different platforms (the Nintendo Wii, DS, Xbox 360, and PS3). A few months have passed since those releases and while he is a little late, Thor is back yet again and now in full 3D on the Nintendo 3DS. Baring the same plot and cast of characters, you would think this would be just a quick cash-in on Nintendo’s latest technology. That is where you would be wrong though, as I found this godly romp to be one that was enjoyable and solid throughout most of the experience. So what makes this title stand above it’s console brethren? Here is my review for Thor: God of Thunder for the Nintendo 3DS. I would imagine by now, most of you would know what to expect as far as a plot goes with Thor. Players take the role as the thunder god himself and have to save Asgard while seeking vengeance against enemies from the popular Marvel comic series. Yes, it’s the typical narrative you would expect, but told in a somewhat different perspective from the other versions of the game. Oddly enough however, I felt this version did a better job at pulling the player through the game as everything feels much more organized and a bit easier to follow overall. Back when I played the Xbox 360 version of Thor, one of my biggest complaints was that the pacing felt so off that it was hard to actually enjoy the story. This title however fixes those gripes and uses comic-book style cutscenes to not only to give off an interesting plot, but also to provide a bit of fan service to those who remember the god of thunder before his days as a cinema star. Voice acting and small cutscenes are also present, but thankfully both of these elements compliment the overall narrative and make this trek through the Norse worlds much more exciting this time around. It’s always astonishing how much a simple platform change can improve gameplay mechanics, but in Thor’s case, the 3DS feels like his one true home. 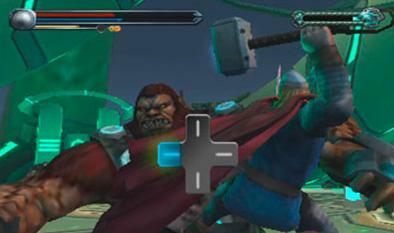 Players control Thor by using the slide-pad and control attacks with a combination of the face buttons and the touchscreen. This may sound like a large task at first, but the whole scheme is honestly well organized which makes the game much easier to just pick up and play. Thor is indeed a bit of a beat-em-up action title, but it also has quite a bit of platforming mixed in as well. Thankfully, our hero can jump like a true god and effectively land on whatever platform is ahead without much problem thanks to the responsiveness of the slide-pad. 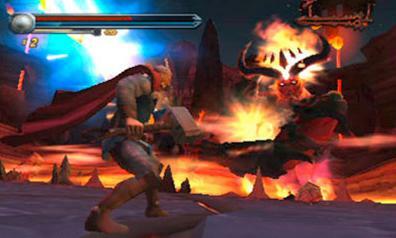 Much like the other installments of Thor, the 3DS version includes enemies ranging in size and type. As always, our hero is readily equipped with his trusty Mjolnir to smash through all foes at will. 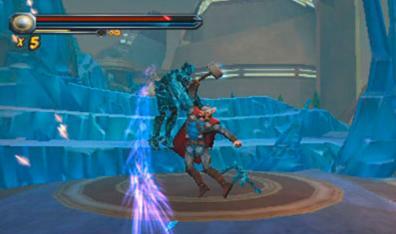 This hammer attack is usually effective for close combat, but Thor can also spin it above his head with the tap of a shoulder button and lunge it at an enemy without missing a beat via a homing method. Yes, it’s just a hammer attack, but I found it to be quite satisfying for the most part as it actually felt useful this time around. New attacks can also be learned over time that allow the player to perform specific techniques based on button combination. While this bit of depth was nice to see, most attacks still felt the same as no matter which way the hammer hits the enemy, it still does about the same amount of damage. As you may have guessed, this bash and go style of combat can lose it’s luster later on, but there is still other tricks up our hero’s sleeve to at least attempt to keep the combat fresh. 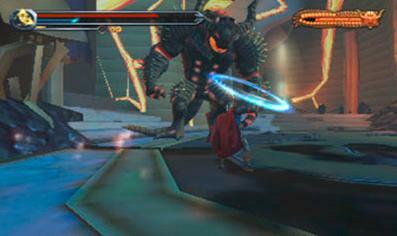 As the player progresses, several powers become available at your disposal. Collecting upgrades enables these elemental based powers to be used, letting Thor shock all enemies on the field with bolts of lightning or spin out a strong tornado that will whip through foes blocking your path. Many other powers also come into play as well, so throughout the game there is always incentive to carry on just to see what new tricks this god can learn. Runes also come into play and provide boosts to powers and defense once a certain number is collected. It’s not the most complex upgrading system by any means, but I felt like the vast number of techniques available definitely helped myself better feel like the powerful persona I was portraying. Combos are equally as important, as a meter will go up upon each consecutive hit which eventually enables a much greater special attack to then be executed. As deep as this whole system is, it can still be a bit repetitive as the game progresses. The main objective in each area is usually to fight off a set of enemies, move forward via platforming, and then run into a boss at the end before moving on. Bosses are fun to fight for the most part, but sometimes the quick time events provided can feel more of the same as it usually requires the same button combination to defeat the larger enemies, no matter what their race. I do have to give it to Red Fly for offering some new mechanics other than the “smash and go” battle system though. 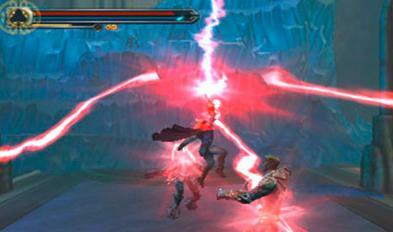 At times, Thor will be forced to move to a new area and the player will have to fire projectiles at enemies while flying into the new setting. These moments are rather short when they occur and don’t happen frequently, but this add-in definitely worked well and was one of the places Thor shined the brightest. Thanks to it’s genre and working combat, most players should have no problem saving Asgard more than once as everything stays solid throughout. You can definitely see a bit of other games sprinkled in like God of War or Devil May Cry, but that really isn’t a problem as that formula works and honestly, most decent action games have followed the same formula. While not entirely original, Thor: God of Thunder is at least enjoyable and controls well up until the mighty final boss. 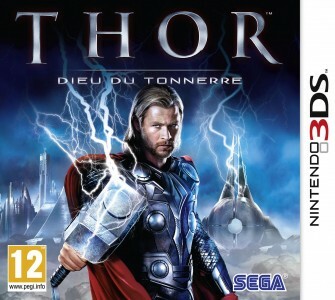 Other than first party titles, I think Thor may be one of the strongest games visually on the 3DS at the moment. Each model is smooth and appears polished and the 3D function compliments the action well without blurring or ghosting. I wasn’t a total fan of the environments though, as compared to the detailed characters they can fall flat with their rather plain textures. I also noticed some minor glitches such as our hero passing through walls and enemies portraying bizarre animations at times. Little touches though like the comic-book inspired images and fonts can however make this title feel straight out of the Marvel Universe, which is definitely more than I can say about the next-gen cousins released earlier this year that bare the same name. Thor also has a nice little score packed in, with tunes that compliment the action and assist in making bigger battles more exciting. I doubt the soundtrack will drop many jaws, but it at least fits into the Norse setting and gives players a reason to keep those speakers up. The same voice cast from the movie such as Chris Hemsworth also do well at reprising their roles and make each character feel true to their persona. Another one of my complaints with the Xbox 360 version of the game was sound effects. The 3DS version though fixes that problem for the most part though with each hit of the Mjolnir and every bolt of lighting sounding crushing and ultimately satisfying. If Thor for the 3DS could be described in one word, it would be “surprising”. There isn’t anything too groundbreaking, but Red Fly at least delivered a polished combat system that is fun to use and the third-person perspective has never looked better with the God of Thunder. Yes, there is still a bit of monotony along the way, but if anyone wants to truly take on the role of Thor himself, there is no better way to do it than in this portable version. Unfortunately, I feel like the delay of release may make this game go unnoticed as Thor’s moment has now passed in the mainstream. Those who happen to see it on the shelf though and crave for a decent action romp that gives off plenty of that Marvel atmosphere should definitely consider giving this god another go.